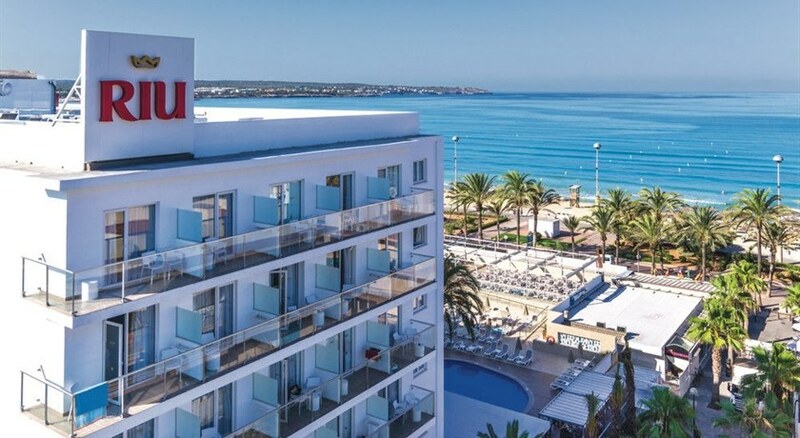 The 4 Star Riu San Francisco Hotel is located right on the beachfront in popular Playa de Palma on the island paradise of Majorca. Separated from the sea by the well-kept seafront promenade, this superb 4 Star hotel makes a charming base for couples and friends featuring 133 double guestrooms with modern amenities and some overlooking the sapphire blue Mediterranean and nearly 6 km of fine, white sand. 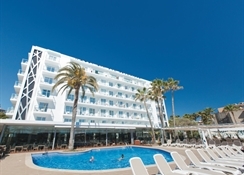 Guests to the Riu San Francisco Hotel can relax on marvellous beaches and explore countless tourist attractions and facilities such as shops, restaurants, pubs, and discos. Palma de Mallorca Airport is 3 km from the hotel. Food, drink and entertainment: Half Board accommodation. 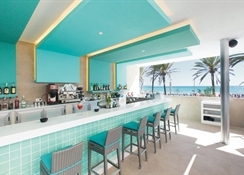 There is a main buffet restaurant, Lounge Bar, Lobby Bar, and poolside bar. There are theme buffets three times a week, and live music several times a week, and there is a dress code for dinner. Sports, games and activities: Outdoor swimming pool heated in winter, sun terrace, complimentary sun loungers and parasols by the pool, towels (deposit required), games room with TV/video and reading corner, assorted water sports available at the beach, mini-golf, nearby tennis courts, horse riding, bicycle hire and 18-hole golf course. Additional: 24-hour reception, currency exchange, car hire, bicycle hire, motorcycle and moped hire, meeting and conference room with TV and video, cyber corner (with charge), Wireless LAN zone (additional charge), Use of computers with internet access (additional charge), lifts, bookings for excursions, bicycle storage room. 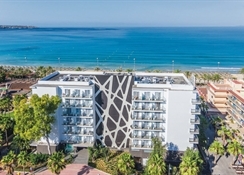 The Riu San Francisco Hotel features 133 double rooms with carpeted floor and fitted with a full bathroom (with bidet), hair dryer, telephone, Satellite TV, music channel, in room safe (with charge), fan, central air conditioning and heating (according to season), mini bar and a balcony or terrace with land or sea views.